The American goldfinch (Spinus tristis, also Carduelis tristis) is a strict vegetarian. Any insects that it eats are accidentally ingested. It only eats seeds, preferring those from plants with composite flowers such as sunflowers, asters, thistles and dandelions. They also eat grass seeds and some tree seeds, including those from elms, birches and alders. 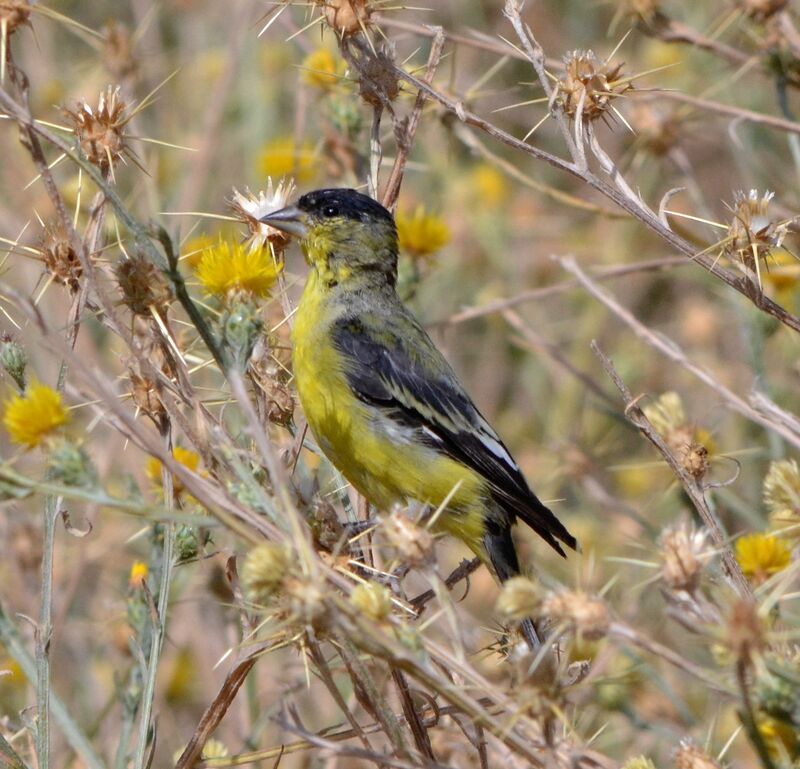 The natural habitat of this small finch is weedy fields, floodplains and cultivated areas. In the non-breeding season these goldfinches are gregarious and form large flocks. The male American goldfinch is easily recognized with his bright yellow breast, black wings with white bars, black cap, short conical bill and notched tail. They are year-round residents of backyards where they entertain with their acrobatic balancing on seed socks filled with nyjer. The female is much less distinctive. In the non-breeding season the American goldfinch male is much duller. Found throughout the United States and Canada, the American goldfinch only migrates south from approximately the northern third of its range – away from areas where winter temperatures often drop below 0°. This male American goldfinch was enjoying the yellowstar thistle at near the Crystal Lake Fish Hatchery (Shasta County CA). This entry was posted in Birds and tagged American goldfinch, nature photography, Spinus tristis. Bookmark the permalink. I love to see the finch when they come to my feeder. Agreed! I love the flashes of bright yellow as the finches flit about.